History – Leongatha Cycling Club Inc. Compiled from –“A short history” by Jim Geary and historical records. 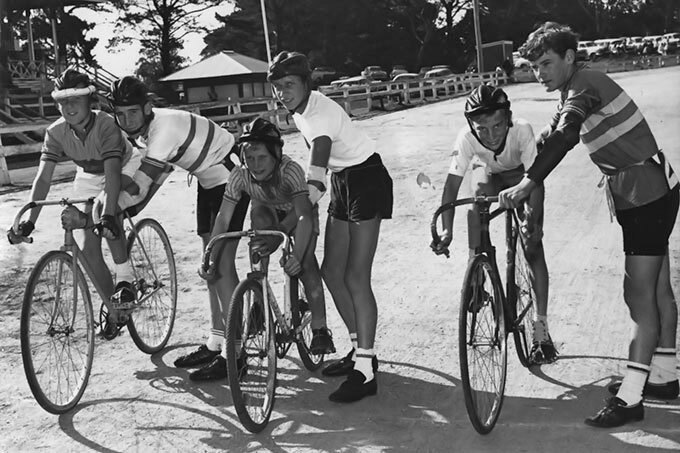 In 1957, 1st Constable Jim Geary who was a competitive racing cyclist stationed at Leongatha, conducted the Leongatha heats of the Victorian School Boy’s Cycling Championships. There were four local school boy’s competing, including Norm Geary. He also conducted the 1958 heats and again there were four competing, this time including Allan Williams and in 1959 included Andrew Martin. Jim was also assigned the running of the 1960 Gippsland Zone final held in Leongatha. After the heats for the Gippsland zone final of the Victorian Schoolboy’s championships in June 1959, Alan Williams, Andrew Martin and Norm Geary were determined to keep riding and to accommodate this Jim Geary set-up racing on Saturday’s. The first race was held on 11th July 1959. It was a 7.5 Mile out-and-back handicap race between Alan, Andrew and Norm on the Wild dog valley road towards Fairbank. It was won by Allan off scratch. In the following weeks other riders quickly became interested in racing and it was decided with the help of two ex-racing cyclists, George Martin and Walter (Wal) Slaney to call a meeting with the purpose of forming a Cycling Club. The meeting was held in Edneys Panel Shop on the 13th October 1959 forming the Leongatha and District Amateur Cycling Club with 26 riders. Barry Geary, Andrew Martin and Ian McInnes. At that meeting the newly formed committee moved that the annual membership fees due as of 1st November be 10/- ($1) for seniors and juniors under 16yrs 5/- (50c) Entry fee per race was set at 6d (5c). The track season to officially start on the 1st November and the Road season conclude with the Club championship held over 10 miles of the “schoolboy’s course” with both a mass start and a sealed handicap. The meeting was signed off by the new president George Martin. The Club held road racing from May to October over distances of around 10miles and it was usually out-and-back, as there were very few sealed connecting roads. 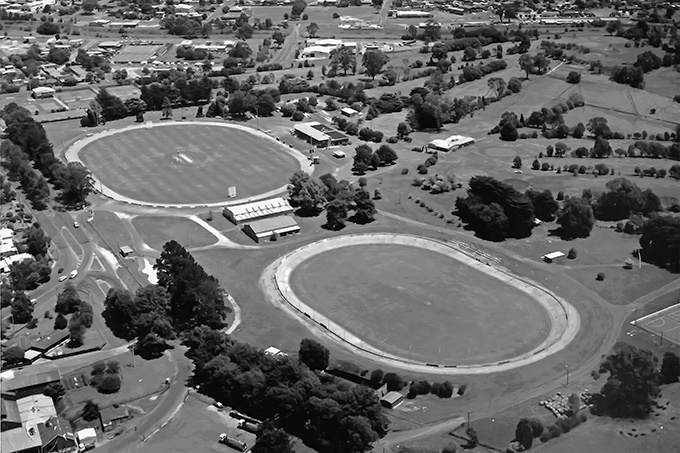 Track racing was held on the trotting track around the football Oval in the Leongatha recreational reserve between November and March each year. The Club had to share it with the horse trainer’s and the Cricket Club with riders often having to contend with the rough gravel surface left by the trotters training on the track. The agreement with the horse trainer’s was for them to smooth the surface after their training with a ‘Drag’ made by George Martin. On the Saturday afternoon’s that cricket was played, racing took place during change-of-over’s. The very first race was held with just 3 riders, a month later 5 and at end of the road season – 20 on 7th November. Jim Geary has recorded rider handicaps and times from the first race in 1959 and is still officiating in the same way in 2015. Allan Williams won the 1960 Gippsland schoolboy’s zone final. Compiled from – as recounted by Terry Watchorn, Jim Geary and historical records. 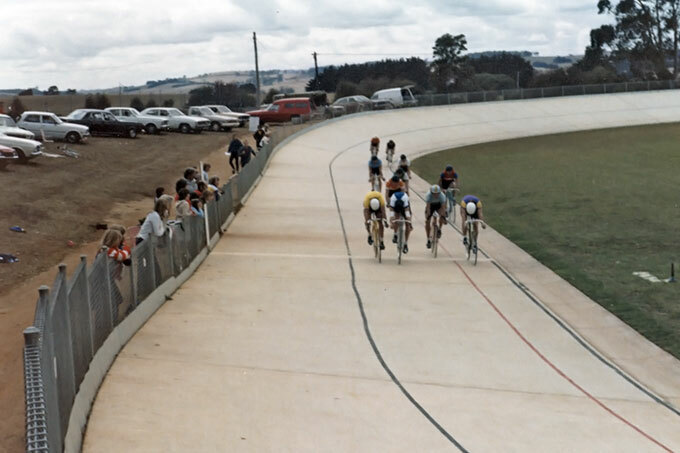 By the early 1970’s, the Leongatha Cycling Club was looking for a site to build a Velodrome, as the Club had been holding their racing on the gravel track around the perimeter of the Football oval in the Leongatha Recreation Reserve. Lindsay Love holding Ron Oataway, Jack Wendburg h-? Eddy Fowler h? Club members were keen to have their own dedicated Velodrome and began working in many different ways to build up the necessary funds. A couple of notable efforts were made by Cedric Wilson who began collecting Aluminium cans to recycle and Norm Geary cutting and selling firewood from his farm. The old newspapers for recycling had previously been collected from the Newsagents by the Pony Club were now collected by members as another valuable source of revenue and it is still continuing in 2015. The Club also ran dances, fancy-dress balls and dinners. All the members’ efforts had proved to be very valuable towards the Club’s fund-raising, which had accumulated to about $8,000 in the bank. The first suggestion for a suitable location for a Velodrome was in the Industrial Estate, where the BMX track was ultimately built. A second suggestion was that it be built in Hughes St., where Knox’s have their depot. 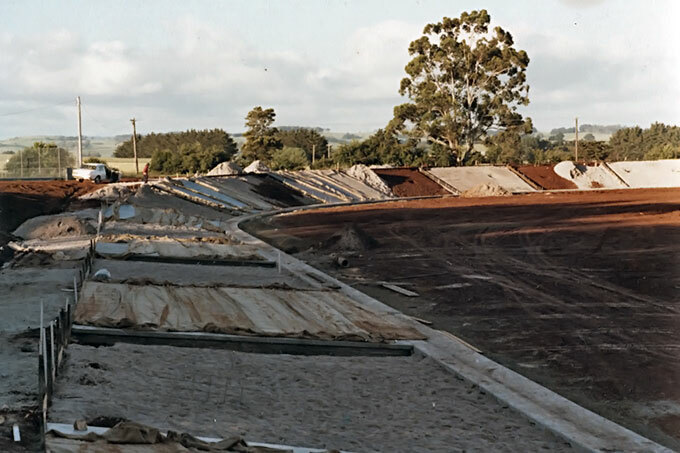 One day in about 1977, Jim Geary, Wal Slaney and George Martin invited several councillors including the Shire Engineer Keith Godridge, to meet with them to discuss improvements to the gravel track around the Football oval. The discussions soon moved to whether the Cycling Club would be interested in the re-development of the bottom oval as there was a possibility of getting a government grant for a multi-purpose sporting venue. This suggestion came as quite a surprise to the Club. The lower Oval had a cricket pitch and it was still being used by the Show Society to show animals and machinery. There were sheep yards and a dip and it was also being used for car parking. At a meeting with the various sporting Club’s in the town, including the Football and Cricket Clubs’, no one had enough money available to put into a major project, except the Cycling Club, who had the $8,000 from the fund-raising. This gave the Club the advantage to apply for a grant available from Premier Cain’s Labor Government, under the “Regional Employment Development” (R.E.D.) scheme. The Shire of Woorayl also put up money, and the Cycling Club pledged to put in cash and labour as their contribution, to make the project viable. By mid 1978, the Cycling Club had the approval to build the Velodrome with the help from several councillors, including Ted Hattam and Jim Haw. Keith Godridge was also very keen on the idea and promoted the project. The geometry of a Velodrome has to be correct for riders to hold their line through the bends at full speed. At the time, Malcolm Powell a former champion cyclist from the Blackburn Club and an engineer who had studied the geometry of building a Velodrome happened to be working at the Yallourn Power station. He came across to meet Keith Godridge. Keith took a bit of convincing that another engineer’s input was necessary, but later finally agreeing that Malcolm’s input was of immense help. The usual length of a Velodrome is 250 or 333 metres. The distance of 400 meters was chosen because the site was to be a multi-purpose venue. The area inside the Velodrome had to be big enough to cater for cricket, football, athletics and other similar events. One of the Velodrome’s greatest assets is that it is a natural amphitheatre, which offers great views of the sporting arena itself and of the surrounding countryside. The earthworks were done by the Shire outdoor staff and it required a lot compacting to stabilise the site before the concrete slabs could be laid. Under each slab on the banking, Club members had the unenviable job of hand digging five large foundation holes. A concreter from Dandenong won the contract to provide and lay the concrete track. All went well, except for two concrete panels that were rejected by Keith Godridge as being not up to specification and were re-poured. It was responsibility of Geoff Coulter as the Shire project engineer for supervising the works and setting out the exacting tolerances for the duck-board levels around the base of the track. The aim was to keep the track as level as possible but still allow drainage to the pits. He was very pleased on completion that when the track was check-surveyed the pole line measurement was within the allowable tolerances for a 400m track. This enabled the Club to run Championship events. 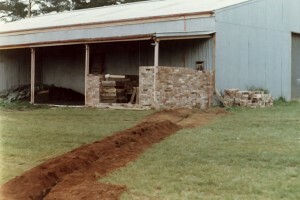 After the track was laid, Club members with an agreement with the Shire engineer that work would be of a high standard commenced the task of fencing. All of this was done at working bees and sometimes after work of an evening. The Velodrome was completed early in 1979 and it was decided to have an opening day. At the time there were no lights so it had to be during the day. Firstly, it was decided to be a Club race, then a Combine, then an Open. The Victorian Amateur Cycling Union (VACU) suggested that Leongatha Cycling Club could have an Open race because that date was available. The Club chose the Open and contacted as many riders as they knew in Melbourne. The Club was getting a fairly good response. 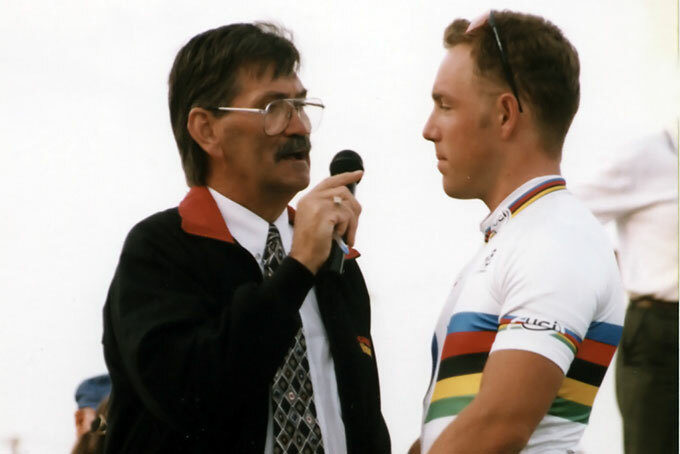 Terry Watchorn contacted his riding friend Stuart Doyle, who had a part-time job of calling cycle racing to ask if he would call the racing at the Open. Stuart happened to be at the airport picking up Kenrick Tucker, who had flown in from Rockhampton to be a guest at a Brunswick Junior Cycling Clinic, run by Stuart Doyle. (then later by Alan Grindal) Terry negotiated with Stuart to get Kenrick Tucker to come back the following week and ride at the Open. Kenrick agreed; providing LCC paid the airfare. Kenrick Tucker was a Commonwealth Games champion, fresh from winning two Commonwealth gold medals in Canada in 1978. 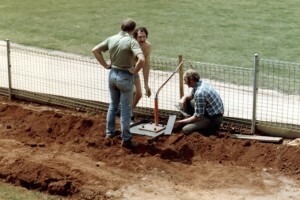 In 1980 the Club decided to install lighting around the track. Working bees were held helping Brian Turner and Norm Geary fabricate the poles at Turner’s engineering using money that was left over from the Government grant. Ryans Transport (both Tom and Luke Ryan were members) transported the poles to and from Melbourne for galvanising free of charge. 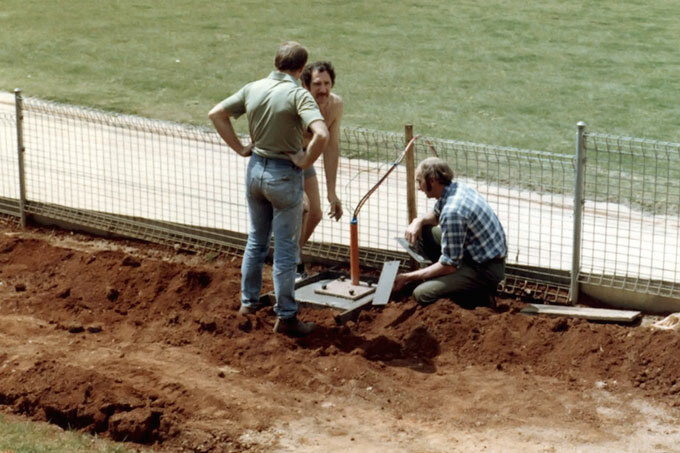 John Sauvarin, an electrician and local Club member, oversaw all electrical work, including the laying of the power lines and their connection to the Velodrome with the help of all Club members working very hard. Colin Watt supplied his crane truck to stand the poles up as his boys were riding at that time too. Geoff Leeden, whose boy raced with Blackburn, got the lights at a discounted price. To house the Club bikes, power board and equipment, the Agriculture & Poultry Show Society made available two veranda bays of their pavilion, which were adjacent to the southern end of the track. Club member Robert Warren bricked in the veranda and the Trevorrow’s provided the roller doors. A state-of-the-art Public Address system was then installed by about the mid 1980’s. Most of this work fell on John Sauvarin. Prior to this, the Club had hired a P.A. system mounted on a van and this was parked in the centre of the Velodrome for the staging of the carnivals. 1980 Open – finish of 800m handicap. For each carnival, the Club had hired portable toilets, which were usually poorly received. Club members then decided to purchase some second hand site-toilets and install them near the finish line. 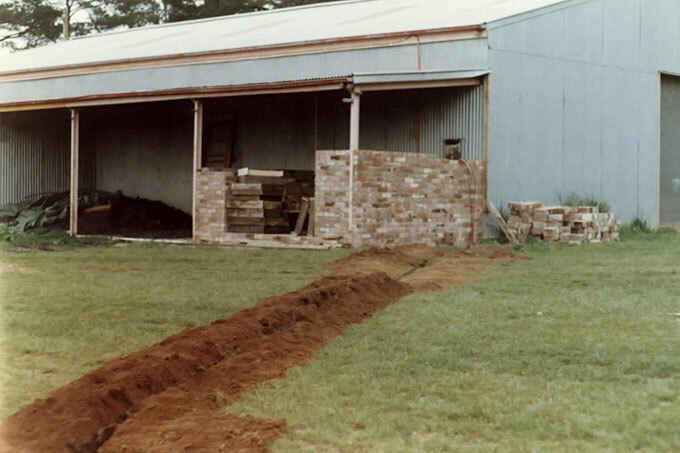 This involved extending the power system and installing a sewer extension from the line serving the netball rooms. Fortunately, the water supply was adjacent to this location and was installed by Club member Gary Campbell, a plumber from Phillip Island. The Club sited the two portable units 2.5 metres apart so that by roofing over them and adding a roller door it created an extra storage shed. An aerial view of the Velodrome – looking southwest. 17th Nov 1978 – Velodrome drawing approved/signed by Shire engineer Keith Godridge. 1st Feb 1979 – First ride on the new Velodrome. 24th March 79 – Grand opening of the multi-purpose venue – Open event. October 1979 – negotiations for lighting the Velodrome began. 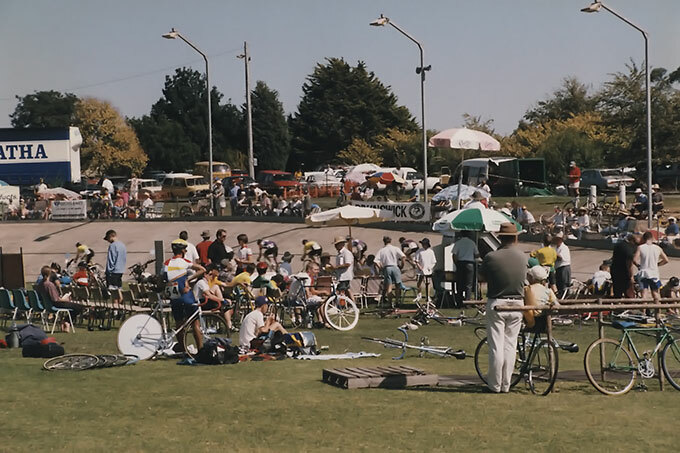 In the 29 years of the Leongatha Cycling Carnival was held on the local Velodrome some fantastic racing was witnessed by great crowds of up to 6000 spectators. There were 52 world Olympic and Commonwealth Games Gold Medallists and 94 Australian and State Champions that raced at Leongatha during that time. No other sport in all of Gippsland could have brought that many Champions of their sport to compete locally. Riders from USA, Canada, South Africa, Germany, England, Scotland, Wales, Holland, Japan, New Zealand, Malaysia and Italy came to Leongatha to compete during their stay in Australia. They all loved racing on a big open track with the friendly atmosphere of a country carnival. The Club put on racing to suit all types of riders from sprint events to endurance. There was also the big 2000 metre handicap wheel race that was an event unique to Australian cycling, modeled on the famous Austral wheel race. This event had various sponsors and was sponsored by South Eastern Building Society, Compass, Ryan’s Bricks and Kelvin John’s Retravision. Some great names appear on the winners’ board including Olympians Shane Kelly and Brett Aitken. The sprint derby was won five times by former world champions’ Garry Neiwand and Stephen Pate, also Shane Kelly has won it twice. The popular Kierin saw Steven Pate dominate this event by winning it seven times. The Club also ran a junior 8km motor paced title for riders under 17 and riders winning this would go onto be become Australian champions including, Paul Dobson, Shane Kelly, David McKenzie, Brett McCaig, Luke Roberts, Brett Lancaster, Mark French, Mark O’Brien. Women’s racing was also included in the carnival with handicap, scratch, sprint and keirin races. Some of the top female riders to compete were Olympians Kathy Watt, Kerrie and Anna Meares, Rahna Demarte, Michelle Ferris, Rosealee Hubard, Lynette Higginson, Jessica Berry, and Rochelle Gilmore. Tandem racing was also run proving popular with riders and spectators. Other events were included to try and bring in people from other sports, including a footballers’ relay with the local football teams of four competing, sky divers and valentine day girls. When C.U.B. came on board as a major sponsor we had the Fosters girls and a sponsor’s tent catering for 200 sponsors with meals and drinks supplied. The big fireworks display at the end of the Carnivals was a fitting finale to it all. Following the wash-outs in 2005 and 2006 and although running a successful carnival in 2007, the Club voted to stop the carnival. The carnival was run for those 29 years never costing the Club any of its own money. It was self-supporting and when it stopped in 2007, had money in the bank and 200 sponsors. This would not have been possible without the complete backing of all Club members who took it on themselves to do whatever was asked of them. The town and district embraced it, supported by local and Melbourne businesses who gave generously and of course riders throughout Australia came to race, returning every year. Yes, it was a great success story and all involved should feel very proud of the Cycling carnivals. Terry Watchorn established a great rapport with the elite riders enabling their enthusiastic return to the Carnival year after year. 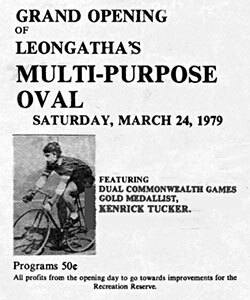 The members’ contribution to the Velodrome construction and the running of the Cycling Carnivals has been a major part of the Leongatha Cycling Club history. Welcome any corrections or suitable material to add. Photo’s for Galleries – must have names, event and dates. Great to read the history of the Leongatha Cycling Club ( originally : LDACC) & that it is still a very active organisation. I am still pushing pedals as an active member of the Perth Over 55 Cycling Club, which is not a racing club. The o55’s ride for the enjoyment(coffee), exercise & socialising. Great website, KEEP PEDALLING. Thank you for the history of the cycle club. I remember the early days very well and followed many races leaning out the car window to give boys drinks and oranges. I also made the first flags used by the club on Mums old treadle sewing machine. In the photo of the group1964-65 you have Andrew Davenport. I believe his name was Adrian .Not Andrew. I have passed your comment on to Terry Watchorn!